2V-R8 is a Seneschal-series factotum droid outfitted to serve the galaxy's most dangerous individuals. Due to experiences with previous masters, he knows that any moment of weakness or failure could easily result in his permanent deactivation, and he has therefore created multiple subroutines to reroute all his processing capabilities, maximizing his efficiency when seeing to whatever single task his master has assigned him. Despite the constant fear of destruction hanging over his head, 2V-R8 makes every effort to appear professional and composed. He has activated numerous crisis-management programming modules to assist him with handling the stress on his processors. So far, his power core has overheated only once. C2-N2 is a model of gentlemanly manners and polite efficiency. A Hollis-series steward droid that served one of the Republic's most famous heroes, he will do everything in his considerable programming power to ensure that his master's starship always maintains the proper air of respectability. This includes high-powered dusting capabilities, monitoring the crew's caloric intake and a selection of aromas from across the galaxy to satisfy even the pickiest of noses. The droid designated HK-51 is cold, calculating and incredibly lethal. Housed in a sleek body resembling an antique Systech Corporation protocol unit, this HK-series assassination droid lay dormant in the hold of an Imperial vessel for many years. Whatever HK-51's original programming dictated, he pledged absolute loyalty to his new master upon his reactivation. HK-51 is a model of ruthless efficiency. His assassination protocols deteriorate unless they are put to frequent use. This leads to a constant acquisition, pursuit and permanent removal of qualified targets that would be seen as an obsession in any living being. Beyond expressing pride in successful assassinations, HK-51 has little patience for the trivial emotional problems of organics. Treek is an enthusiastic warrior who defied her primitive tribe's rigid customs to seek adventure among the stars. 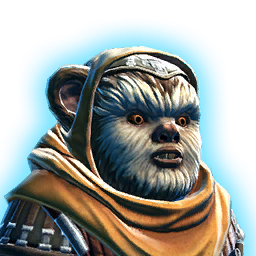 Dissatisfied with the peaceful and quiet ways of her people, Treek is determined to achieve great things with her life. She travels the galaxy as a mercenary soldier, always on the hunt for new horizons and epic challenges to conquer. Despite hailing from a technologically-archaic planet and species, Treek has adapted quickly to civilized space. Treek is unconcerned with material possessions or personal power. Her only goal is to forge a legacy that will outlive her. In Treek's mind, the greatest defeat is to be forgotten. She will do whatever it takes to ensure her name and deeds will be celebrated long after she is gone. Treek hurls a spear at an enemy target dealing <<1>> weapon damage and causing the target to bleed for <<2>> internal damage over <<3>> seconds. Treek hurls a cluster bomb above an enemy target, where it explodes and deals <<1>> kinetic damage to all enemy targets within 8 meters. Does not hit sleeping, lifted, or incapacitated enemies. Treek blows a whistling flame at an enemy target, dealing <<1>> elemental damage. Treek glides to an enemy target within 10-30 meters, immobilizing it for <<1>> seconds and walloping it for <<2>> kinetic damage. Treek shatters a beehive near an enemy target, unleashing a bee swarm that stuns all enemies within 8 meters of the target for <<1>> seconds. Treek drops a smoke bomb, which significantly reduces her threat and causes enemies to ignore her for the next <<1>> seconds. Treek sends a fektur bug at an enemy target. The fektur bug lands on the target and evaluates it for up to <<3>> seconds. If the target attacks a party member, the fektur bug flies to that party member and heals them for <<4>>. Treek tosses a medicinal berry at the ground near a friendly target, healing all group members within 8 meters of the friendly target for <<1>>. Treek heals a target group member for <<1>> over the channel duration and an additional <<2>> at the end of the channel. Treek may not heal herself with this ability. Treek injects a friendly group member with medicine that heals for <<1>> over <<2>> seconds and cleanses one negative mental or physical effect with each tick. Treek hurls a spear at an enemy target dealing <<1>> weapon damage, causing the target to bleed for <<2>> internal damage over <<3>> seconds and generates additional threat. Treek hurls a cluster bomb above an enemy target, where it explodes and deals <<1>> kinetic damage to all enemy targets within 8 meters. Does not hit sleeping, lifted, or incapacitated enemies. This attack also generates additional threat and reduces the damage dealt by enemy targets by 5% for <<2[%d seconds/%d second/%d seconds]>>. 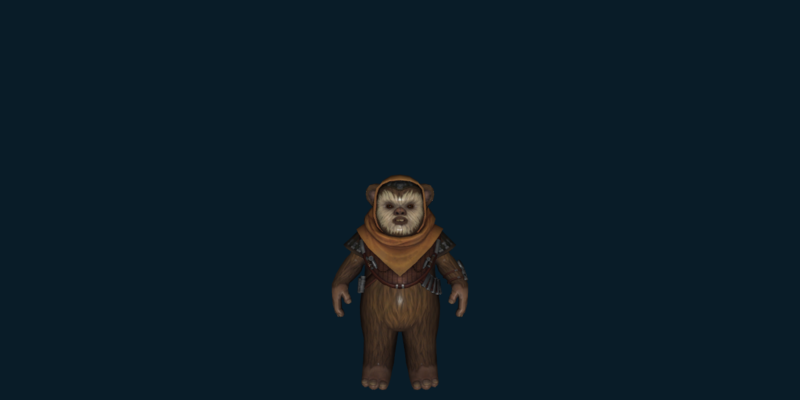 Treek blows a whistling flame at an enemy target, dealing <<1>> elemental damage and increasing Treek's armor rating by 20% for <<2[%d/%d/%d]>> seconds. This attack generates additional threat.